"Like a whisper at the back of his consciousness rose the vague memory of the name of an ancient god of darkness and primordial fear, to whom once both men and beasts bowed and whose children -- men whispered -- still lurked in the dark corners of the world." 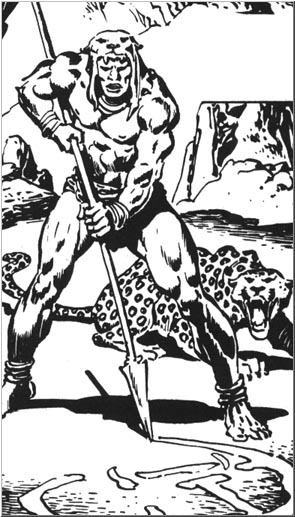 -- Robert E. Howard: "Beyond the Black River"
All animals, including man, once worshipped Jhebbal Sag, the Lord of Beasts, and spoke the same language. Now, most have forgotten, and only the largest, smartest and strongest animals remember the earliest days. Those who remember are bound together, however, and can be controlled by one who serves Jhebbal Sag and knows the language of the animals. In most cases the only men to remember the ancient language of Jhebbal Sag are those who are descended from his loins. According to legend, there are groves throughout Pictland and the Black Kingdoms where the old Beast Lord sometimes still visits and takes his pleasure among the females of the animal kingdom. Sometimes he mates with a pantheress, doe, or a woman. And from these matings come a steady supply of exceptional creatures who are brothers in spirit as well as blood. By demonstrating the power of the Call of Jhebbal Sag, the priests of Jhebbal Sag prove to be of the old god's blood. A god of all beasts who lurk in the wild places, and men who act as beasts, fang and claw are the laws of Jhebbal Sag. The satisfaction of his primordial needs are his goals. For millions of years he has loped through his wild lands in the form of one great beast or another; for such is his pleasure. When man came he added them to his stable. From him they learned to rip and tear one another like beasts. Jhebbal Sag is the leader of the animal gods (including Jullah the black gorilla-god and Jhil, the nighted god of ravens) and all of the other animal totems serve him. Jhebbal Sag is worshipped almost universally in the Black Kingdoms, as well as among the tribes of the Pictish Wilderness. Jhebbal Sag can manifest as one or several natural animals. He might also send one of the lesser animal gods (Jullah, Jhil, etc.) or their servitor creatures. It is said that Jhebbal Sag likes to come out at night; there are tales from men and women who have seen his eyes burning like yellow coals in the darkness. Jhebbal Sag can manifest as any natural or dire animal (with maximum hit points and intelligence for the chosen species, and 25/+1 damage resistance), or he can possess up to 40HD worth of natural or dire animals for an unlimited period of time, 1/day. Priests of Jhebbal Sag are usually shamans or witch doctors of a tribe. They hear the whisper of the Beast-Lord on the wind, bring meat to his altars in sacrifice, and bring women to his sacred groves. In addition to being able to summon and speak with the animals who serve the Lord of Beasts, the priests of Jhebbal Sag also learn the secret of the magical Symbol of Jhebbal Sag, an ancient, mystic sign which even the wildest animal is cowed before, and draws not near. Ajaga, Beast-King of Abombi, was a priest of Jhebbal Sag.